The most popular dumbbells on the market are the Bowflex 552 closely followed by the Powerblocks, but what makes both of these sets so popular? The ‘Bowflex select-tech weight adjustment system’ has been around for over a decade and it is Bowflex who first patented the design, I can be certain it’s this time saving, select-tech feature that has helped sell thousands of the adjustable pairs. To adjust a Bowflex dumbbell you can simply turn a dial either end of the handle to the weight you wish to lift, it’s an extremely fast design, that is reliable and foolproof. It’s not only design that sells a product, reputation has a lot to do with it too and Bowflex has a reputation for quality and you get exactly that with the 552 dumbbells. Powerblock is another company you can trust, their adjustable dumbbell sets are durable, fast to adjust and, best of all, their sets are expandable. What’s an expandable dumbbell? Powerblock were clever enough to realize people who bought their 50lb per dumbbell set will improve in strength over time and outgrow their dumbbell set. Now, rather than have you go out and buy a completely new heavier set of dumbbells, Powerblock designed their dumbbells in such a way you could buy separate weight packs for your 50lb set. With the Powerblock elite series, you can turn a 50lb set into a 70lb set and the range goes right up to 90lb per dumbbell. That’s pretty heavy and there’s not going to be many lifters out there who will need dumbbells heavier than 90lb each. In this comparison review, we will compare the Bowflex and Powerblock dumbbells on their 3 most important features. Bowflex – The Bowflex 552 has a weight range of 5 – 52.5lb and can be adjusted in increments of 2.5lb up to 25lb, it’s always good to see increments of 2.5lb, you will see many other similar dial select dumbbells offering increments of only 5lb. 5lb increments can be somewhat limiting for many people training, particularly so for beginners, especially on isolation exercises where the need to go up in 2.5lb increments is greater. If you buy this set of dumbbells, the max weight you will ever be able to lift per dumbbell is 52.5lb, because of the design there is absolutely no way of adding any extra weight to either of the dumbbells. Unlike the Powerblocks, Bowflex do not provide any expansion weight packs for the 552’s. It’s not a deal breaker, especially if you can’t see yourself lifting over 50lb per dumbbell in your lifetime and most people won’t! But for the more serious of bodybuilders and strength trainers the lack of expansion packs will be a thumbs down for the Bowflex pair. 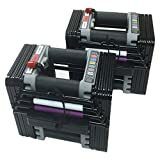 PowerBlock Elite 50 – The weight range of the Powerblock elite 50 set is 5 -50lb and similar to the Bowflex the Powerblocks can be adjusted in 2.5lb increments. and as mentioned earlier the sets are expandable. There’s no risk of outgrowing the Powerblock set because they give you the option of buying expansion packs. This makes the appeal of the Powerblock much wider, they are popular not only for beginners but for serious bodybuilders and strength trainers. Weight range and max weight – Winner Powerblocks! Bowflex – I know, whenever I think of Bowflex, I think of premium high-quality fitness products, and there’s no exception here, the Bowflex pair are a well-made set of dumbbells, they have put a lot of effort to try and make the set as durable as possible. But there are flaws in their design, the select dial a weight system inevitably brings the need for a lot of plastic to be used in the build and as many of you might have guessed plastic and weightlifting are not the perfect match. There have been reports of split plastic casing and problems with the handles. To be fair I have seen thousands of positive ratings for the 552’s with an average of 4.5 on Amazon, the problems seem to be few and far between with the Bowflex’s and most of these problems are caused by drops. If you cover heavy metal with plastic and drop it, I’m sure you can imagine it’s most likely going to crack the casing, so whatever you do, don’t drop them! Drops from any height are not covered in the warranty. If you’re careful with the Bowflex pair they will last you, it’s a shame the designers of these new school dumbbells love to use so much plastic in their designs, it doesn’t really suit the nature of weightlifting as weight lifting will always involve drops, especially if like many of us you like to train to failure. One of my main concerns with any adjustable dumbbell is handle length and the Bowflex 552’s have some of the longest handles I’ve seen. The handles are a fixed length, this basically means whatever weight you choose whether it be 5lb or 52lb the handle stays the same length. Long handles can prove to be awkward when pressing and curling, the preferred handle is compact, you want the dumbbell to feel as natural as possible or as near to a fixed weight dumbbell as you can get. Powerblock – Powerblock provide a ten-year warranty with the elite range, this definitely shows to me a considerable amount of confidence in the durability of their products. They have used some plastic in the design of the handle but no plastic surrounds the weight stacking system. Overall a much more durable design than the Bowflex. Although there is minimal plastic used in the Powerblock dumbbells, Powerblock does give some guidance on drops, their official word is don’t drop the dumbbells from a height any higher than 12″. What does this mean? Well, they are not going to take a beating but you can be a little rougher with the Powerblocks than you can the Bowflex. The handle length of the Powerblocks only increases as you add the weight, resulting in a compact design thanks to the staking system of the weights. A compact design will give the dumbbell a more natural feel when training with them. If you are used to training with fixed weight dumbbells in your local gym then the Poweblocks are trying their hardest to get to as close to this feel as possible. Build quality and durability – Winner Powerblocks! Bowflex – By far the fastest of the two sets, the Bowflex select-tech dial a weight system is simply awesome, it will speed up your adjustment times between sets to 5 seconds. No longer do we have to unscrew collars and add weight plates manually the dial a weight system does away with all of this. Just a quick turn of your wrist and you can select a weight of your choice. So how does the dial select work? On each end of the dumbbell handle, there is a numbered dial which you can simply twist and select one of the 15 weight adjustments available. The plates will attach to the small brackets inside the handle when you turn it. Once locked in place you can pick up the dumbbell leaving the unselected weights behind. And because of the separate dials at each end, it is possible to select a different weight for each end of the dumbbell which can be important for certain exercises. Something that other twist lock dumbbells like the Core Fitness or Stairmasters do not offer. Powerblock –With adjustment times of around 20 seconds per dumbbell the Powerblocks are slightly slower to adjust than the Bowflex pair. 2o seconds is by no means slow but the extra time is mainly due to the 2.5lb steel tube you need to add to the handle if you wish to adjust your dumbbells in 2.5lb increments. If you are adjusting in 5lb increments using just the magnetic selector pin then you’re going to see times almost as fast as the Bowflex. Ease of adjustment – Winners Bowflex! Adjusting the 2.5lb increments takes slightly longer because of the need to manually at the cylinder to the handle. To sum up, the Bowflex 552 adjustable dumbbells can not cut it against the might of the Powerblocks. The Bowflex adjustable dumbbells are great for speedy adjustment times and hats off to them for creating such a foolproof adjustment system, but when it comes down to the nitty-gritty you want a dumbbell that’s compact, durable and gives you the option to grow, you get all of this with the Powerblocks. The Powerblocks are no slow coach to adjust either, their adjustment system is proven to be one of the fastest out there. If Bowflex had included an option for extra weight expansion packs then this comparison might have been closer but for now, the only other set of adjustable dumbbells that come close to the Powerblocks are Ironmasters 75lb set.